In the second leg of the round of 16 game between Barcelona and AC Milan is bound to become one of the all-time classics of the UEFA Champions League. As is generally known Barcelona was in a difficult initial position. A two goals shortfall from the first leg had to be equalized, a task generally considered impossible. Even a lot of fans of the Catalans had already given up the hope due to the reason that Barcelona seem (seemed?) to undergo a period of weakness. After the loss against Milan they lost two Clásicos. But eventually everything should turn out quite differently. What did the Italians change in contrast to the first leg? The answer is: Not much! Mathieu Flamini started instead of Sulley Ali Muntari. Flamini is considered a bit better in defensive play. Apart from that there were no major changes in Milans tactic. Additionally, Niang replaced Giampolo Pazzini. The differences were not that big and the change was mostly forced due to an injury of Pazzini. Niang offered less width than Pazzini and made the life of the Spanish centre backs much easier. In the defense, the Italians tried to move similar to the first leg, at least after Barcas first goal. Before the goal they tried to press in a 4-3-3 shape. Afterwards they switched back to the 4-5-1 with Niang upfront and a plane five in the midfield. Boateng and El-Shaarawy played as wingers and worked in the defense. In the centre they showed a lot of man-to-man marking and only Montolivo sprinted out of his position. He tried to confront Xavi and harm his passing but with very little success. Messi received a special treatment too. The two defensive midfielders and fullbacks (especially Mexes) tried to take a position close to him and to quickly intrude him when he was getting the ball. His runs should be stopped at the very beginning. The reason why this caused trouble and Milan generally appeared much more unstable was not due to their plan but the one of the host. Pre-match reports rumored that Barcelona would switch to a 3-3-4 shape. And eventually it was one – at least in the offense. Jordi Alba moved up only situationally while Alves lived up to his reputation as the most offensive of the offensive wingbacks. The Brasilian is still not as effective as he was 2 years ago but fulfilled his tactical task. This lack of symmetry of the wingbacks made for an 3-3-4/3-4-3 in the offense and a 4-3-3 in the defense if necessary. Mascherano played as the fullback who moved up and sometimes switched to the right. Thus Gerard Pique was able to drop back a litte and play as safeguard. Additionally Alba and Mascherano are more dynamic and are able to get into the challenges more fiercely making Barcelona less vulnerable against counter attacks. Owing to the improved staggered arrangement in the width of the pitch the effect was even reinforced. This style of playing reminded of Barcelonas strategy under Guardiola with Eric Abidal as more defensive wingback. However, there was a small difference in the synergies which developed. Usually there was a withdrawn forward like Thierry Henry and David Villa who also played in this game. Due to Albas dynamic, intelligence, strength of passing and the resulting diagonal advances, it was Pedro Rodriguez who played left this time. He continuously provided width and rarely took part in the numerous switches of position. David Villa switched into the middle and freed up Messi who primarily switched into the space right of the centre. For this reason, the both player, being able to pierce through the opponents lines, Iniesta and Messi were both playing side by side. In some way it was back to the roots. Andres Iniesta started as offensive central midfielder, drifting over the whole pitch and playing in his prime role as a “needle-player” – a player who plays in tight space without losing the ball due to his immense pressing resistance. Xavi played more vertical than usual in his passing as well as in his paths, partly due to Iniestas role on the pitch. 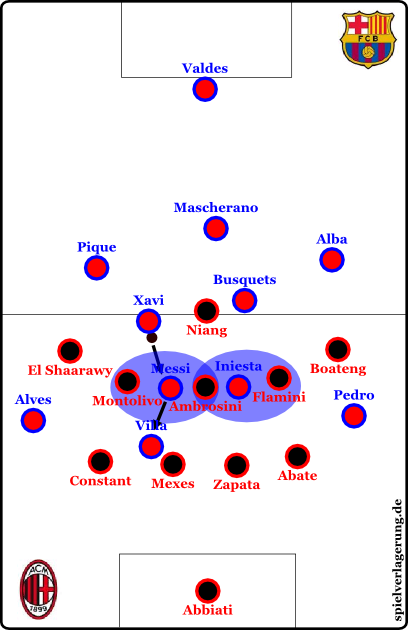 Iniesta frequently dropped deep, covering Xavis position on the pitch or making a more risky movement of Xavi possible. This effect was enhanced through Sergio Busquets who did not play in the line of three players, backing up the offensive movements. Thanks to Busquets’ higher position he was able to engage in the attacks and was a further stabilizing aspect. A vertical fluidity emerged in Barca’s game with a lot of zonal overloading which caused a lack of effectiveness of Milan’s situational man-to-man marking. Milan only appeared stabile at times. All in all Barcelona was clearly superior. The changes of the team’s line-up and the passing and movement patterns and the different roles of the players in the game which evolved for this reason lead indirectly to new problems for Milan. Perhaps the single most important reason for the sudden comeback was the aggressive and intensive pressing of the Catalans. It wasn’t in existence for the whole 90 minutes but it lasted for a large share of the game. The positions in the counter pressing was not ideal but fulfilled its purpose; the same goes for the forward pressing which lacked the right timing from time to time. After all it was a decent match of Barcelona’s defense. Most likely this was also due to the psychological effect of pressing. Milan had certainly adjusted to much less pressure in their build up play. This came apparent when they were keeping the ball for too long and turned around or played “blind” cross passes. The most obvious scene in this aspect took place in the first half when Barcelona was standing to high and width in their pressing. Milan stood fanned out and instead of exploiting the holes in Barcelona’s line-up, Milan played a risky pass to the middle of the pitch which could be intercepted easily. Milan only rarely found the right passing pattern. Too frequently, they made the wrong decision: Badly timing their counter attacks or rashing their build up play. Admittedly, simply such a tactic against AC Milan would not have led to such a convincing victory. It was the outstanding individual behavior of Xavi, Iniesta, Busquets and Messi which caused this spectacular victory. Iniesta was not only important in the distribution of the ball, the collective movement and his playing in tight spaces before and between the opponent lines but could also convince in the pressing. He almost never moved to late and only rarely dropped back but otherwise found a way in the forward and counter pressing after a loss of the ball, leading to increased stability. This was also decisive in the build-up to second goal where he won the ball in counter pressing. With five tackles he also had the second highest value of all the players, only surpassed by Riccardo Montolivo. Behind him, Xavi also showed some great movements and added some verticality to his game. This is also apparent in the statistics. He “only” reached 90% pass accuracy instead of 95%, played three key passes (on average 1,4) and also one pass through the defensive line of Milan (on average 0,3). Additionally, 11 out of 12 of his long passes reached the teammate (on average 7,9). He also found the right timing in his forward movements and the right spaces to play into, causing Milan’s repressing pressing from the first leg to be much less effective. As mentioned, he was supported by Busquets who repeatedly showed the same stroke of genius. From time to time Busquets let his field of vision and his body look in one direction and played the pass in another than his body would have suggested. This pass – should it be called wrong-look-pass, referring to the no-look-pass? – led to a wrong movement by the opponent, who anticipatively already moved in the direction of the alleged receiver of the pass. Besides the effect that it opened spaces, a main reason for the first goal, it also led to a psychological effect on the opponent. “Another key feature of Barca’s game was their intense pressing, which has been lacking in recent weeks. By its very nature, pressing is about the whole side doing it together, but Sergio Busquets was key. Even by his standards, he was quite sensational, particularly with his positioning and reading of the game. Last but not least we continue with Lionel Messi. The Argentinian not only scored his goals with enormously swift completions from dense areas but also used his dribbles differently than in the first leg. In the first match he sought open spaces and tried to pick up speed from there and move toward the goal. Now he positioned more in the narrow areas and used his nearly absurd pressing resistance and ability to run with the ball to maintain the ball. Consequence: Milan contracted the room between the lines around Messi but Messi escaped this movement (especially through playing the ball by the opponent player), leaving Milan unorganized. Then they reorganized deeper and Barca had gained some space. Villa’s switch to the middle of the pitch led to the problem that Milan could not as easily contract around Messi due to a more difficult communication. When Villa switched to the middle, the two centre backs (especially Mexes) that usually moved forward were left in an unclear position, not being able to additionally press Messi from time to time. The Argentinian benefited vastly from this fact. Milan had to change something. A narrow loss would have been alright. But at least after the 3:0 from Villa, something had to be changed. With Robinho, Bojan Krkic and Sulley Muntari for Mathieu Flamini, Massimo Ambrosini and Niang they switched to a 4-2-3-1. 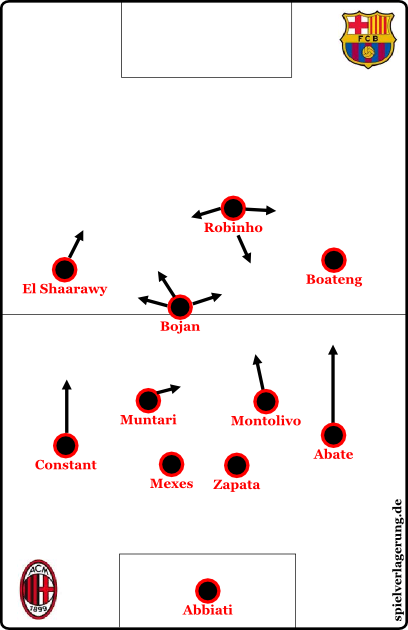 Robinho played as a shuffling middle forward, Bojan played right behind him and the players on the wings stayed the same. back Abate played higher) and attacking patterns were important. Due to the fact that Milan stayed higher on the pitch and altered their passing patterns so that they did not have to rely as heavily on the psychological aspects, they improved. 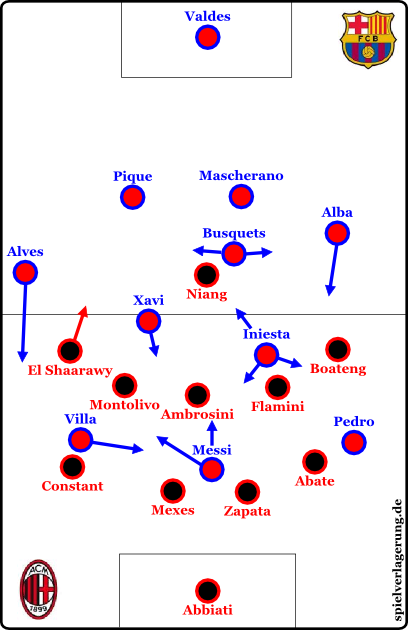 Whereas Barcelona moved deeper, played less aggressively and restricted the pressing. This meant more time and space for Milan. They managed to move deeply into the half of Barcelona for the first time, used the movements of their fast forwards and overcrowded some areas. On the right side this happened through the extremely offensive Abate, whereas on the left side Constant played a little more conservatively but got supported by Krkic and El Shaarawy. The Spanish player sometimes switched to the left and sought areas; after a successful dribble and the following pass into the box it nearly led to a goal. Eventually there were no remarkable positive changes through these measures. Barcelona was able to keep their clean sheet and only replaced players on the right positions. Finally they even scored after a counter attack. Bravery to play passes in narrow areas, occasional return to pressing, changed usage of spaces and a nearly dramatic acceleration of the pass circulation led to a breathtaking performance of the Catalans. The celebrated their resurrection and shattered the system of Milan which had worked very well only a few weeks ago. Barcelona returned to their former style of playing and were much more agile without Fabregas due to the fact that the two needle-players in the half spaces (Messi and Iniesta) were reunited. The Italians on the other hand did barely change anything but simply faced a completely changed opponent. The opponent fulfilled his promise of a 4:0: A victory thoroughly deserved. Italy’s pressing was much less effective than Portugal’s pressing against Spain in the semi-final – maybe as the numbers game was more complex – Italy had 4 v 3, that turned into 4 v 5 and players seemed unsure of their responsibilities. Portugal had pressed 3 v 3, and each player had a clear opponent to mark. Nicely done! This report lays a focus on the brilliant recovery of Barcelona, and rightly so. But I’d like to pick up a question from my fellow commenter FL: What could Milan have done better, esspecially defensively? Was Barcelonas dominance only due to their improved tactics and attitude in combination with their excellent players? Or did they exploit obvious weaknesses in Milans game. Did Milan make significant mistakes, individually or determited by their system? What could a coach of a coming opponent of Barca learn from this game? Keep it up spielverlagerung, great job. Love your site! What about a paypal donate button somewhere, so we can sponsor you? Simply put, it was like watching ‘old school’ Barcelona. It was in complete contrast to what they produced at the San Siro for the first half of the opening period in particular. Cant wait to see Barca against a ‘proactive’ team like BAYERN, could be a heck of a game with a ridiculous score line.